My four year old, Logan, has been introduced to the wonderful world of color by number. He discovered this gem when he started preschool. He came home and I helped him find a a large fun pad with color pages for kids. Inside there were color by numbers galore. He was hooked. He has never loved coloring like he does now! Logan's very clever preschool teacher has not only given him color by number, but also color by letter. What a fun way to help kids with the visual recognition of letters! Because he loved coloring letters and numbers equally, I thought it might be fun to also add a little practice with shapes. I created some Halloween coloring pages for practicing number recognition, letter identification, and shape knowledge.He has been loving these and begging for more! I went a little crazy making these and I thought it would be a fun freebie to share with all of my amazing readers! I hope your kids love them as much as mine. In the packet, there are a variety of coloring sheets. 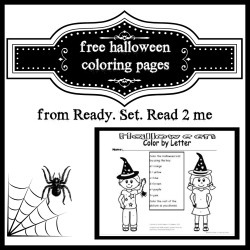 Each sheet is provided as a blank coloring sheet, as a color by letter, a color by number, and a color by shape. Here's a peek at the Halloween set. These are FREE in my Teacher's pay Teacher's store! I am working to reach 100 followers in my store. I'd love to meet my goal by the end of the month. If I reach 100 followers, I have some Thanksgiving themed color by letter, number, and shape coloring pages that I will offer completely FREE! Help me out by following my store while you are there. 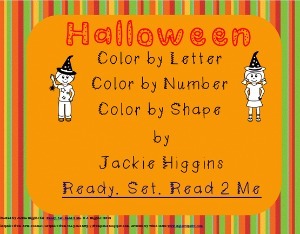 Also included in the packet are two fun fall coloring pages for practicing upper case and lower case letters. These printable worksheets let kids practice capital and lowercase skills in an apple orchard or a pumpkin patch. These could be great for home or school! I'm thinking these would be awesome morning work on the day of a pumpkin patch field trip or a fall party day. They will keep your kids engaged while providing something fun and thematic. Let all your friends know about this freebie and encourage them to follow my store while they are there! Click the picture below to download for free from my teachers pay teachers store. Jackie, these look GREAT! I pinned and tweeted. :) You're not too far behind me on FB likes. I'd totally be in for collaborating with you, if you're interested.